Packing a nutritionally balanced lunch box and creating delicious and healthy after school snacks is something parents and carer’s constantly struggle with. While we don’t want kids to eat processed, packaged snacks, it is difficult to find healthy alternatives kids will eat and enjoy. We believe the secret to healthier lunchboxes and snacking is getting kids involved. These snacks are not only healthy and delicious, but they are easy to make, and kids can help out in the process. Wrap apple wedges in salami or prosciutto. Press onto a skewer. Kids love anything on a skewer! Kids Task: Allow the kids to wrap the meat around the apple wedges. Grate a couple of unpeeled apples. Squeeze the excess juice into a glass (this is delicious to drink!). 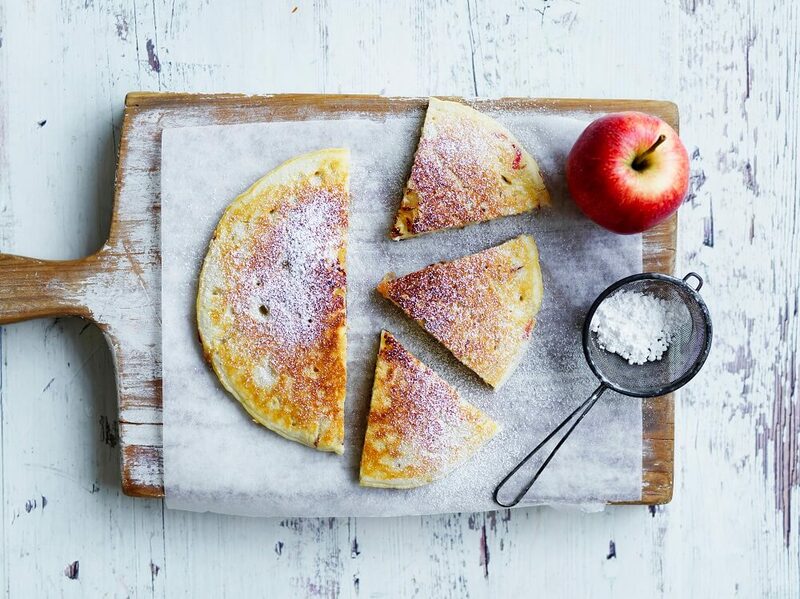 Stir the grated apple into pancake batter. Pour into a pan and cook as one big pancake. Cut into wedges and sprinkle with a little cinnamon sugar. Serve warm or cold cut into wedges. Kids Task: Squeeze the excess juice from the grated apples and stir the apples into the pancake batter. Core apples and cut into thick rounds. Spread with peanut butter, Nutella, cream cheese, or jam and dip in crushed popcorn, toasted muesli or lightly toasted coconut chips. Kids Task: Allow the kids to top the apple slices with their favourite spread and dip upside down in the crunchy topping. working with one small flour tortilla at a time, place onto a plate and microwave for 15 seconds on high until warm. Carefully ease the warm tortilla into a lightly greased muffin hole. Repeat to fill the tray. Brush the inside of the tortillas with olive oil then bake in a 180°C fan forced oven until light golden. On cooling they will become crisp. Combine chopped chicken, chopped apple and shredded lettuce with a little mayo. Spoon into the cups. For a sweet option, spoon some thick custard or yoghurt into the base. Top with chopped apple and crushed shortbread biscuit. Kids Task: Allow the kids to brush the tortilla with oil then help fill the baked cups. Peel, core and thickly slice apples into rounds. Dip in plain flour, lightly beaten egg then coat in panko breadcrumbs. Lightly spray both sides with olive oil cooking spray and bake on a line tray in a hot 220°C oven for 10 minutes until light golden. Serve warm after school or cold in the lunch box. Kids Task: Allow the kids to help with the flour, egg and breadcrumb process. Cut the crusts from sliced white, wholemeal or multigrain bread. Use a rolling pin to roll over the bread slices to flatten. Spread with Nutella, sprinkle with coconut and top with matchsticks of apple. Roll up like a swiss roll. Cut crossways into thirds. Thread all three rounds onto a skewer. Kids Task: Allow the kids to roll the bread flat. Peel and grate 3 cups of apple. Spoon into a shallow 8 cup capacity freezer safe container. Pour over 2 cups of pure unsweetened apple juice (we use apple juice made from 100% Aussie Apples) and 1 cup coconut water. Stir to combine. Secure the lid and freeze for a few hours until semi frozen. Stir again then return to the freezer until frozen. Use a fork or large spoon the scrape the apple ice. Spoon into cups and enjoy on a hot summers day. Kids Task: Allow the kids to scrape the ice with a fork or spoon. spread slices of fruit bread with spreadable ricotta or cream cheese. Top with chopped apple. Crumble over biscuits then drizzle with a little honey. Sandwich together with another slice of fruit bread. Lightly spray the outside of the sandwich with olive oil spray and cook in a sandwich press between two sheets of baking paper until golden. Kids Task: Allow the kids to crumble the biscuits over the apple then drizzle with honey. Spread smashed avocado across the centre of a flour tortilla. Top with grated cheese, diced apple and shredded ham. Fold in the sides of the tortilla and roll up firmly to enclose the filling. Place into a sandwich press and toast until light golden. Serve warm after school or allow to cool and wrap up for the lunch box. Kids Task: Allow the kids to smash avocado with a fork then spread over the centre of the tortilla. Combine a can of drained rinsed chickpeas with 2 diced unpeeled apples, a spoonful of tahini, a squeeze of orange juice, 1 teaspoon ground cumin and a good pinch of paprika. Process until well combined. With the processor on, drizzle in enough olive oil to form a smooth creamy dip. Spoon into containers and serve with wedges of apple for dipping. Kids Task: Allow the kids to juice the orange.